We are excited for the new year and working with all of our beautiful couples! Today we are rounding up some of the trends and wedding ideas we are most excited about for 2019. Finding gorgeous ways to bring mother nature inside through grand trees, rocks, moss and other beautiful natural elements. Image by VOYTECK PHOTOGRAPHY via Brides. Pantone has chosen its colour of the year as a bright, sunny, pinky-orange named "Living Coral". It's a beautiful colour and we are expecting to see lots of beautiful bright colours used in flowers, bridesmaid dresses, cake, makeup and colour schemes. Creating a brilliant photo-worthy confetti moment as you walk out of your wedding ceremony is one of our favourite trends. It's so much fun and creates the perfect Insta-worthy moment. You can call it the Megan Markle effect but simple wedding dresses are definitely making a comeback and we love it too. They are beautiful, simple and flattering for so many types of women and styles of weddings. 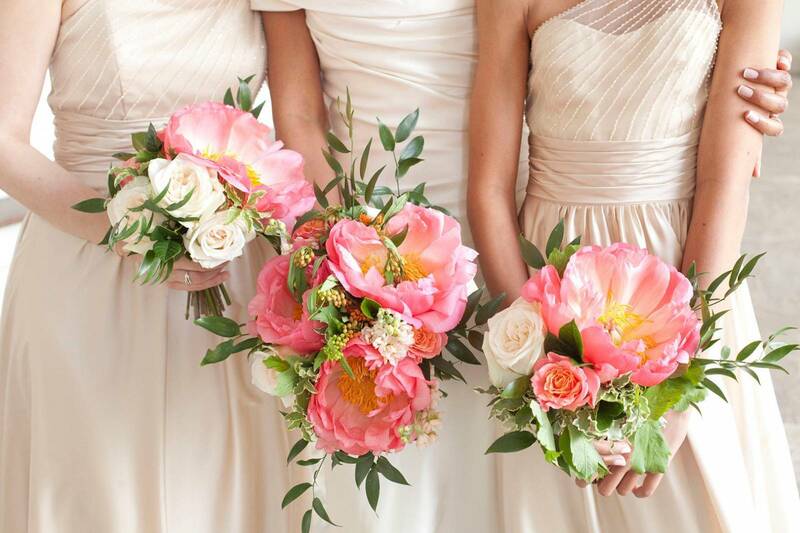 We love that more brides are choosing natural, organic flowers and bouquets that are loose and unstructured. One of our favourite design elements for receptions is beautiful long tables with elaborate garland flowing across them. We created these beautiful flowers for one of our brides and we hope to see more of this in 2019. This is a trend we've seen in the mountains for some time but it continues to grow. More and more couples are choosing special locations and narrowing their guest list instead. Choosing to host a small wedding opens up many more venue locations and options for your day. We love the idea of couples choosing to perform a special and intimate ceremony all by themselves where they can share their vows in private and then join their guests later to celebrate. Grand and elegant cakes are a beautiful statement at a wedding and way to create a show-stopping decor piece for your wedding. Instead of having wait staff walking around the wedding with hors d'oeuvres, we're seeing many more people choose large grazing tables and elaborate antipasto platters where guests can help themselves. It creates a great environment for people to chat and mingle too.